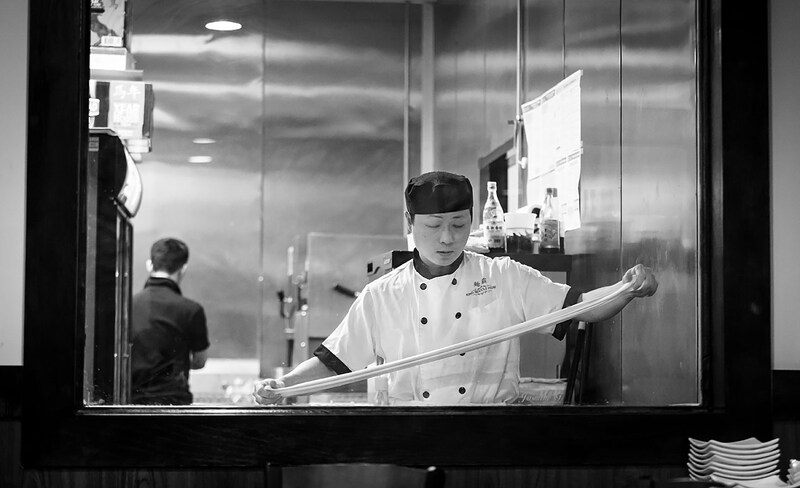 As customers gaze through a window into the kitchen, the noodle master at King Noodle House stretches a ball of dough into a rope, the bouncy mass thinning between his outstretched arms before he folds it back on itself and starts again. Stretch, fold, stretch, fold. 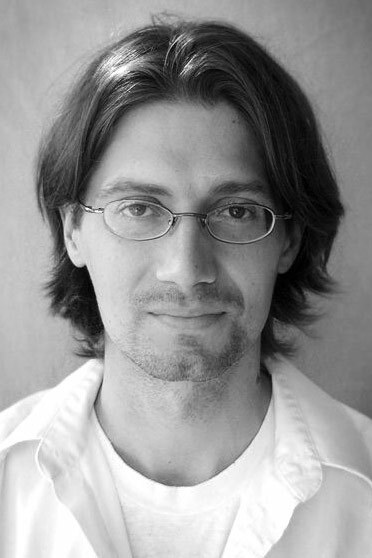 Separate strands are divided by fingers, like yarn in a child’s game of cat’s cradle. After a few cycles, the dough has transformed from a single rope into dozens, perhaps hundreds, of individual strands the size of spaghetti noodles. These freshly formed noodles (plain or spinach) form the foundation of the King Noodle House’s signature soup bowls. From the outside, the restaurant is not particularly distinctive; it occupies the northernmost space in a strip-mall shared with an Asian grocery store, and a furniture rental shop, a paint store and Lanna Thai Restaurant. Inside, the decor is just a step above the a typical strip mall Pho joint: it’s clean but utilitarian, with lacquered topped tables, a wood-grain vinyl floor, wood and steel chairs, and a few Asian prints and statuettes scattered around the periphery. Once you’re seated, though, the fun begins. About half of the tables have at least a partial view of the noodle-master through the kitchen window. With the banging of the noodle dough against the counter during the stretching process, he can be hard to ignore. Each guest is handed a menu and a noodle-soup card. 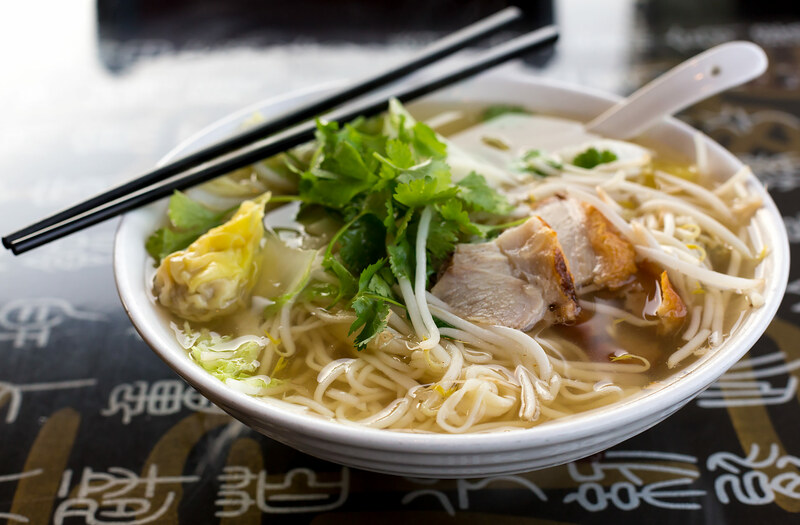 If you’re in the mood for noodles, you can simply mark the check-boxes on the card, choosing between different types of noodles, broths, a dozen or so proteins, and several vegetables. 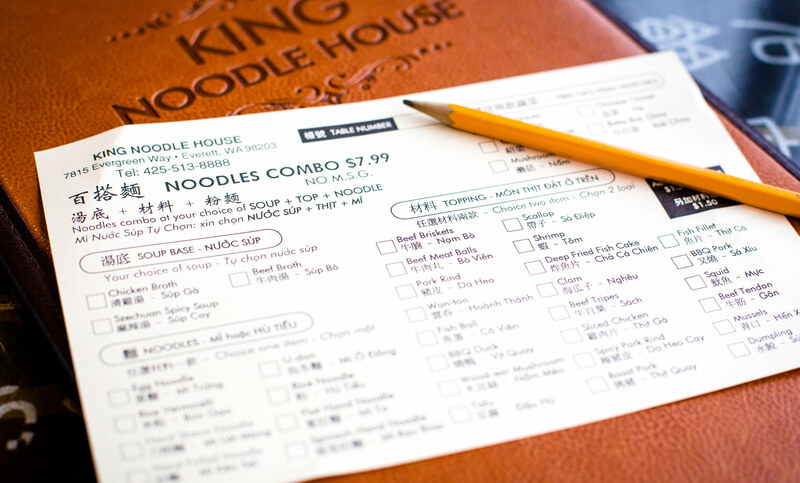 If you don’t want noodles, you can order from their menu of more common Chinese fare. All three broths can be quite good. 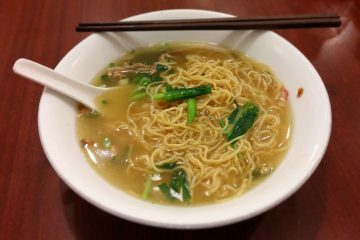 In general, the chicken broth and the beef broth are flavorful but light, salty enough to be tasty but light enough not to overpower the flavor of the noodles and other ingredients. The 3rd soup option is a spicy Sichuan broth, and we’ve experienced some inconsistency here (this is a Smack favorite). Sometimes the Sichuan broth is a rich, brown, spicy broth… but other visits we’re served something like the chicken broth with a dash of chili oil floating on top, which is a little disappointing. Our partially eaten plate of Chinese donuts. I would be remiss if didn’t mention the single dessert option that I’ve tried: Chinese doughnuts. 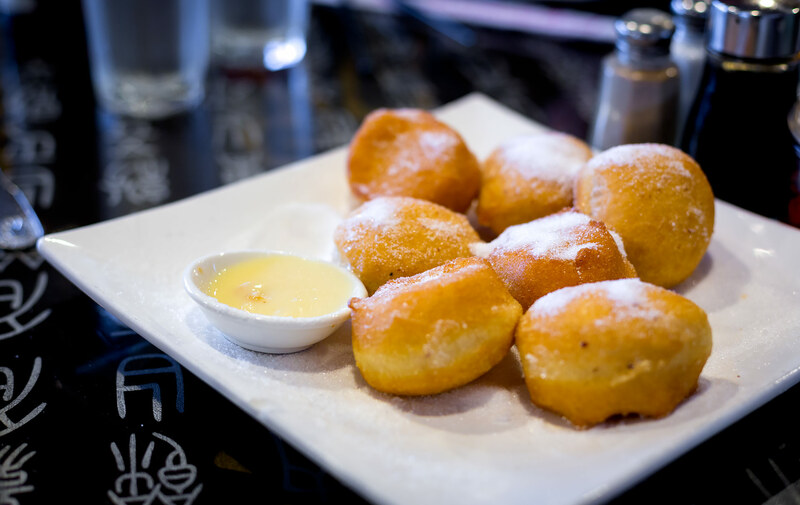 These come piled on a plate, fresh from the deep fryer and coated with a layer of sugar. Unlike American doughnuts, these have no hole and the dough is more bready than sweet, balancing nicely with the sugar coating. I suppose they’re reminiscent of the funnel-cakes or elephant ears that you’d find at a carnival booth, but not quite as sweet, and of course, much smaller. One of my favorite combinations is roast pork and wontons. The rind of the pork is awesome. Before each visit, I tell myself that I’m going to branch out and order something from the full menu, but each time I visit, I order noodles. It’s hard not to, they’re so good. 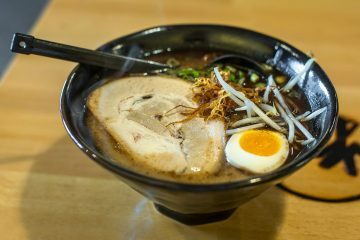 The hand-pulled noodles have the wonderful firmness and flavor of fresh noodles. The hand-shaved noodles, also fresh, are almost as good but slippery and hard to eat with the plastic chop-sticks that are provided: opt for the pulled instead. I like the standard and spinach noodles equally, but usually prefer the spinach with the beef broth, and plain noodles with the chicken (though there isn’t really much difference in flavor between the noodles… it may just be aesthetic). The duck option in the noodles seems like a great idea, but it’s served Chinese style (ie, cut up with the bones still in it), and I find that it’s too much work to be worth it, though I normally love duck. We’re always curious to hear about your experiences, too! If you have something to share, or would like some further information, just let us know in the comment section below! And don’t forget to ADD YOUR RATING of the restaurant in the box below, too! It's not high-brow, but it's very good. The noodles are great, and the service is fast!